What does it mean to be in a constellation? What Do Astronomers Mean When They Say an Object “Is in a Constellation”? Yeah, that really looks like a reclining virgin. It occurs to me that I use a lot of terms that I take for granted but that may mean something else to a reader not as familiar with astronomy or science in general. I thought it might be fun to write some articles defining these terms, so that we’re all on the same page. Our eyes aren’t terribly good at seeing distances; anything past a few meters away is too far for our binocular vision to work. The nearest object in the sky is the Moon (barring satellites or meteors, both of which are a hundred to hundreds of kilometers above your head), and that’s 380,000 kilometers away! So as far as your eyes are concerned, every object in the sky might as well be infinitely far away. The sky is pretty big, so it would be handy to divide it up into sections, giving each bin a designation or a name. Because it seems like the surface of a sphere, we could parse it out using latitude and longitude, like we do on the Earth. And astronomers do do that, using what we call right ascension and declination, very old terms that divvy up the sky into east/west and north/south coordinates. That’s fine, and very useful when you’re pointing a telescope. But if we’re just looking up and enjoying the view, Nature has done us a favor. It’s clumped stars together. Stars aren’t strewn evenly across the sky. In some places they’re closer together, in others not so much. Humans are pattern-seeking beasts, so of course every culture since antiquity has projected their own imaginations onto the sky. 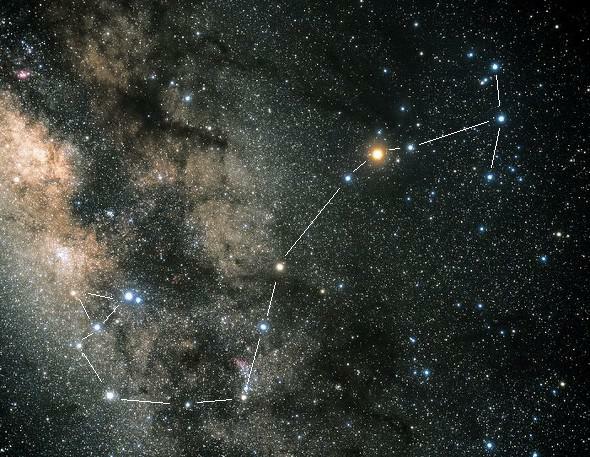 So when you see seven bright stars, they’re not just a box with a slash through the middle at a jaunty angle: They’re Orion, the mighty hunter, the three stars of his belt prominent. Or that twisty S-shaped pattern of stars with two spiked away on the top? That’s obviously a scorpion, and so we have Scorpius (please, not “Scorpio”). 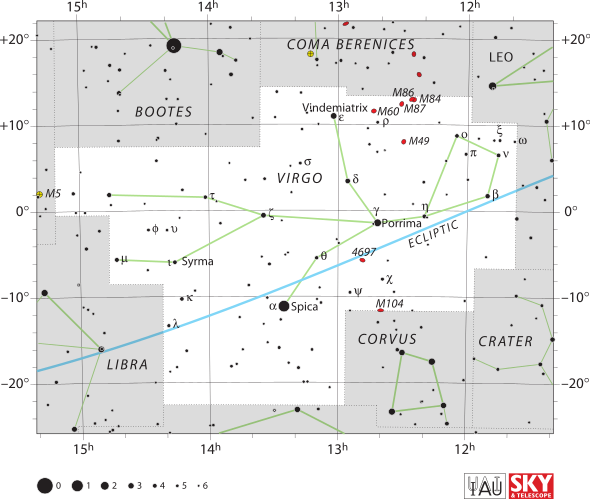 The constellation of Scorpius, annotated to make the shape (more) clear. We call these patterns “constellations”, meaning literally “sets of stars.” For millennia they were only roughly defined, and that could be a problem. The bright star Rigel is obviously part of the pattern making up Orion (it’s his left knee), but if another star is in between two bright patterns, which constellation does it belong to? To clear this up, in the early 20th century, astronomers made more rigidly defined borders to the constellations, the lines demarcating them along north/south or east/west directions. Eighty-eight such constellations were thus defined. You know many of their names: Sagittarius, Andromeda, Pisces, and so on. Most of them are named after their ancient Greek counterparts, so we have Ophiuchus, the serpent bearer, and Delphinus, the dolphin. Others (mostly in the Southern Hemisphere of the sky) have more modern names, like Microscopium (guess what that’s for), and Antlia, the air pump. Yes, the air pump. So now, when we say a star is in a certain constellation, it’s like saying a town is in a certain state or country. It’s inside the official borders recognized by astronomers all over the world. Remember, though, in actual, physical space those stars can be incredibly far apart, one a hundred times farther away than another. They just appear close together in the sky because we can’t judge their distance by eye. In some ways using constellations makes cataloging stars easier. You can designate the brightest one in a given constellation as Alpha, the second Beta, and so on. Most constellations don’t have more than 22 bright stars, so that’s convenient (though in reality it’s more complicated than this). Or you can use numbers for the brightest ones starting with those farthest east in the constellation and moving west (these are called Flamsteed numbers). That’s how we have 51 Peg, and 7 Comae Berenices. You can also just use coordinates to do this, but that’s awkward, like referring to Denver as “39.7392° N, 104.9903° W.” If you’re trying to point a telescope, that’s fine, but in everyday language it’s a pain. There are dozens of catalogs of stars made over the centuries, so stars are usually referred to using those. Thus HD 209458. Sometimes it’s a mix of name and coordinates, and you get BD+46°3474. Planets move relative to the stars as they orbit the Sun, so sometimes Venus might be in Libra, and later it might be in Virgo. What that means in reality is that, from our viewpoint on Earth, Venus is superposed on the much more distant stars making up the constellation of Libra or Virgo. Because most constellations are easy to recognize with practice, they make a handy guide to the sky, becoming as familiar as the neighborhood you grew up in, which in turn makes finding celestial objects easier. I’ll note not every pattern of stars is a constellation. The Big Dipper is a set of seven stars (eight if you include Alcor) that’s part of the bigger Ursa Major constellation. A group of stars like that is called an asterism. Others include the Pleiades (actually a physical cluster of stars) and the Summer Triangle, comprised of the three stars Vega, Deneb, and Altair (in the constellations of Lyra, Cygnus, and Aquila, respectively). You can quibble over semantics like this if you want, but in this case I actually approve of having a definition for constellations, since it’s something that can be defined (unlike “planet”). So there you go. With the boundaries on the sky defined, every star belongs to one constellation or another, so we say that star is in that constellation. The constellation isn’t a physical thing, but a region of the sky. Not that folks don’t make mistakes. For example, in Doctor Who, the Doctor says he’s from the planet Gallifrey in the constellation of Kasterborous. That doesn’t really make sense; constellations aren’t physical places in the Universe. Maybe Kasterborous is a constellation as seen from some other planet, but then why would you define your home planet using some other planet’s arbitrary definitions? It’s probably just an error on some writer’s part, which got carried through the series. If you want to read more, Wikipedia has a good article about this (including constellations from other cultures), and more at my pal James Kaler’s site. But the best way to learn about constellations? Go outside and look up. There’s nothing like learning by doing. *You’re not, though, so this is not to be taken literally.